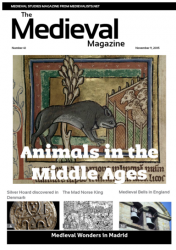 People in the Middle Ages did keep pets – dogs, cats, birds, monkeys and many other kinds of animals. Although they often had particular duties – i.e. hunting or catching rats – there are many accounts that showed affection and love between these pets and their owners. Meanwhile, in Switzerland a list of 80 dogs that took part in a shooting festival in the year 1504 has been preserved. They reveal the most popular name was Furst (Prince). Other names included Venus, Fortuna, and Turgk. Some dogs got their names from the work being done by their owners: Hemmerli (Little Hammer) belonged to a locksmith, while Speichli (Little Spoke) belonged to a wagoner. The 14th century French knight Jehan de Seure had a hound named Parceval, while his wife had Dyamant. Leon Battista Alberti, the Renaissance philosopher, said his dog was sired by Megastomo (Big Mouth). Ludovico III Gonzaga, ruler of the city of Mantua from 1444 to 1478, has at least two dogs – Rubino and Bellina. When Rubino died, Ludovico ordered that he buried in a casket and that he would make sure that the animal would also get a tombstone. Isabella d’Este, a famous Italian lady and also a ruler of Mantua, was known to have many little dogs, two of which were named Aura and Mamia. There was a certain castle whose lord had a baby son from his wife. But when the lord and lady and the nurse too had left the house, leaving the child alone in his cradle, a very large snake entered the house and made for the child’s cradle. The greyhound, who had remained there, saw this, dashed swiftly under the cradle in pursuit, knocking it over, and attacked the snake with its fangs and answering bite with bite. In the end the dog killed it and threw it far away from the child’s cradle which he left all bloodied as was his mouth and head, with the snake’s blood, and stood there by the cradle all beaten about by the snake. When the nurse came back and saw this, she thought the child had been killed and eaten by the dog and so gave out an almighty scream. The child’s mother heard this, rushed in, saw and thought the same and she too screamed. Then the knight similarly once he got there believed the same, and drawing his sword killed the dog. Only then did they approach the child and find him unharmed, sleeping sweetly in fact. On further investigation, they discovered the snake torn up by the dog’s bites and dead. Now that they had learned the truth of the matter, they were embarrassed that they had so unjustly killed a dog so useful to them and threw his body into a well in front of the castle gate, and placing over it a very large heap of stones they planted trees nearby as a memorial of the deed.